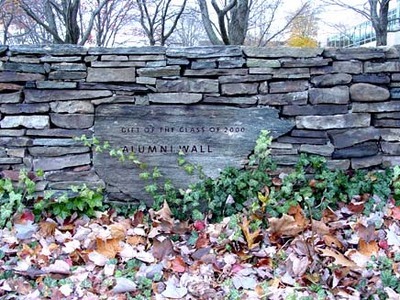 "Class of 2000 Gift -- Alumni Wall"
Alumni Wall is a stone wall along the brick walkway which crosses the quad connecting the George E. Bello Center with the Unistructure. The Class of 2000 wished their gift to be a part of the new quadrangle that would fulfill part of the new Campus Master Plan. This class was the first class to make a gift towards campus campaign objectives.